Note: Any time doing electrical work, make sure the power is shut off, test that it is shut off and have a knowledgeable partner on hand or simply hire an expert. The other day I was closing down the Shoppe and tried to switch on the main light in one of our float rooms. The switch had a squishy feeling behind it and wouldn’t push all the way back into place. I shut off power to the room and removed the outlet. 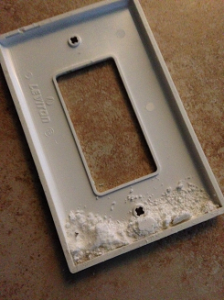 I was surprised to see a tremendous salt buildup behind the switch. There was so much salt that the button was being pushed out of place. I was also very taken aback by just how much built-up there was inside the electrical box. This light and fan switch is located right by our shower and is certainly used a lot. I’m sure one located outside the path from tank to shower would have a much slower buildup. With that being said, I’m constantly surprised where I end up finding salt, so don’t assume those switches aren’t also being used by salty hands! 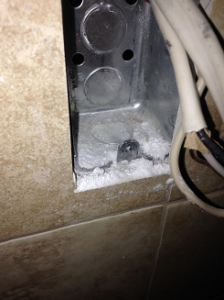 Because of this find, I have scheduled myself to investigate our switches that are located between a float tank and the shower every 6 months. I will also be checking all other switches in the rooms annually. I highly recommend implementing some kind of similar process in your float facility. We were lucky the salt buildup only caused a button to be pushed out. The risk of fire is a very serious one and should be taken seriously. Like so many other things in the float world, this is a very unique issue that only we will face. Be Safe! I have been pulling my covers off in two of the tank rooms and checking since we’ve opened. Sadly, I now have a light switch box right by our open tank and experiencing the switches to die quickly and having to be replaced. Salt and water certainly is the cause and it certainly is NECESSARY to find solutions for this…which Dylan, you hit it on the head! Tear it apart and clean, clean, clean. Ions in water make for speedy electrons driving outside the lines. I bet every time someone touches that switch, just a little bit of super salty water gets in and the whole electrical setup goes kaput. Air buttons are such great solutions. Dylan, you bought ours online, right? Mark, have you looked at retrofitting the switch box with air buttons instead? We end up playing with a few kinds of salty creations around the tanks. Epsom salt is crystalline, whereas what accumulates in hidden places is often something a little different than that: it’s a soft, powdery kind of stuff. I suspect it’s Mg(OH)2, or magnesium hydroxide. That’s right…Milk of Magnesia. I’m keeping my nurse-fingers crossed that we are, in fact, accidentally producing quite a bit of an antacid/laxative in the course of floating people because, well, that’s excellent news for all around. My days of accidentally splashing myself with Milk of Mag at the hospital are over (you’d be surprised how easy that is to do), but I can still enjoy its continual presence at the Float Shoppe. In addition to its medical uses, magnesium hydroxide is used as commercially as a flame retardant. That’s awesome news for all of us float center operators! This gives me some peace of mind when we find it in places we wouldn’t expect, such as near electrical outlets and switches. It truthfully doesn’t light on fire. I tried. A flame held to a pile of this stuff (outside and by a person wearing a head-to-toe flame-retardant suit fortified with magnesium hydroxide) appears to do absolutely nothing. That being said, be vigilant in your cleaning practices, everyone, and do your own research. Salt’s a monster that gets sharper teeth over time.